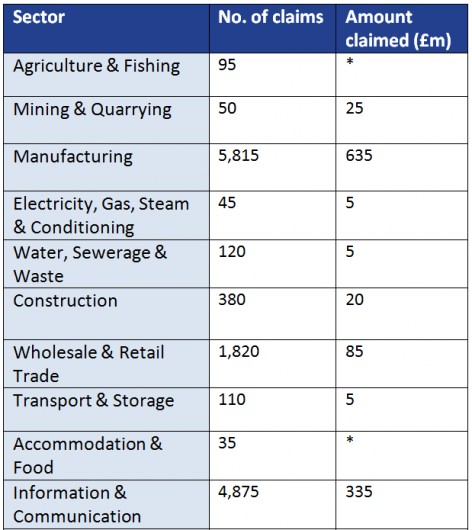 New figures released by HMRC earlier this month show that since the relief was launched in 2000 over 120,000 claims have been made and £11.4bn in tax relief claimed. 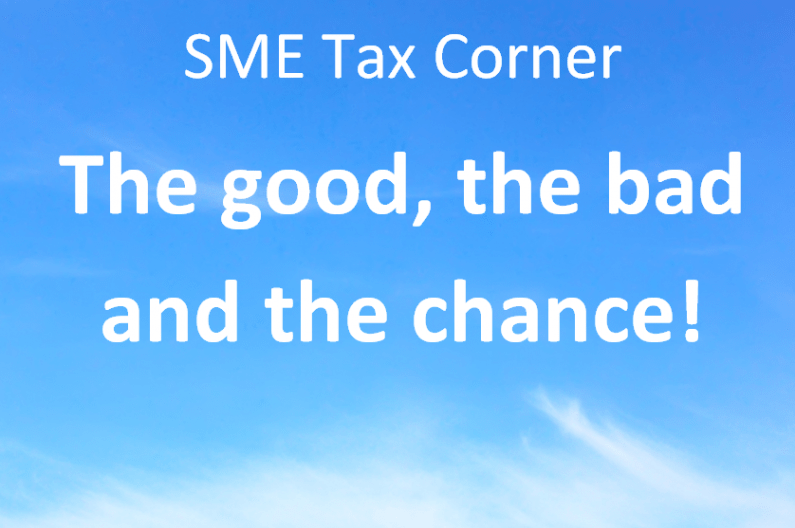 Those numbers are continuing to grow and in 2014 the number of SMEs claiming R&D tax relief rose by 23%. In an article we published on the back of the HMRC R&D update you can see that R&D tax relief is available to small businesses across a number of different sectors, including manufacturing, healthcare, arts, construction and retail. 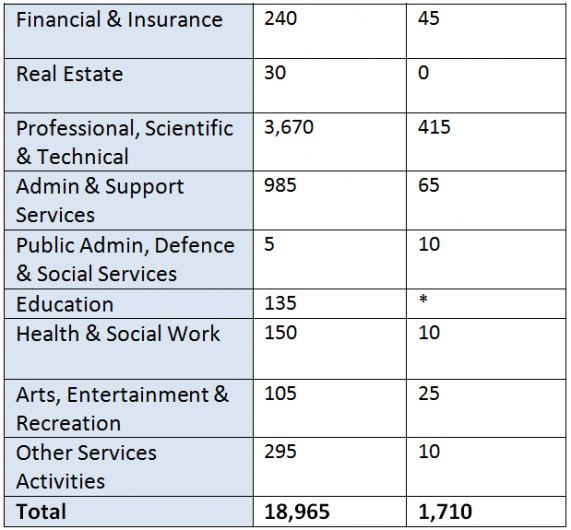 The below table shows a breakdown of R&D tax claims by sector last year. Many small business owners may expect R&D tax claims in manufacturing, healthcare and IT, but may not necessarily consider its applicability to other, less obvious sectors such as arts, entertainment & recreation, transport & storage and wholesale & retail. It is therefore vital that if you’re developing a new product, service or process or materially improving an existing one, regardless of your size, you speak with Hawsons’ R&D tax specialists today. It was announced in the Summer 2015 Budget that the government will restrict the amount of income tax relief landlords can claim on residential property mortgage interest to the basic rate of income tax. Whilst this change may be good news for first-time buyers it brings bad news for landlords. Both landlords who have a sole buy-to-let property and landlords who have large property portfolios are set lose out following the change. The change means that residential landlords will no longer be able to deduct all of their finance costs from their property income. Tax relief will instead be restricted to the basic rate. This measure is likely to make buy-to-let investments a much less attractive opportunity for small business owners in the future and early suggestions are that the two million buy-to-let landlords across the UK could lose around half of their profits. To ease the impact the government will introduce this change gradually from April 2017, over four years. A recent survey by Aviva found that as many as two in three people don’t understand pension tax relief. The survey also found that one in ten had never heard of pension tax relief. These statistics are worrying, particularly as investing in a pension and maximising the opportunities for tax relief on that pension is one of the most significant investments a person makes in their life. Changes to tax relief on pension contributions were announced in the recent budget and you may wish to take advantage of the annual allowance for the 2015-16 tax year. Don’t miss out, act now!